My clients with ADD are passionate about their projects. Their energy for a project is an incredible resource and an important aspect for follow through and completion. As a task moves forward, the energy wanes and people with ADD are less enthusiastic. Staying engaged in the task and completion is equally important. In addition, people with ADD have trouble breaking down ideas into a series of smaller scheduled steps that help them make progress toward their goals. They tend to procrastinate which compounds the situation. Creating a time line is important in following through for people with ADD. People with ADD know what they want, but how much time it will take and what sequence to work in often elude them. Start with the goal in writing and write out the specific steps in the project. Assess the time each step will take. Work backwards in a time line with a month at a glance calendar and write in a workable time line for completion. For people with ADD, enlisting help to get through the detail work with partners and designing a plan with accountability is a significant step. Help them find incredible partners who are have the skills they lack, whether it is knowledge of technology or other skills sets. Acknowledge the procrastination that can occur with people with ADD and find a trigger to help move forward. The trigger can be a simple one, such as a great location to work in, background music, or establishing a time of day to work. It is in partnering and accountability that completion occurs. Trouble completing a task or project? How did you get to completion? This year we decided to “change things up” and went to help others first! Our destination was the SuperFeast here in downtown Houston sponsored by Waste Management. Last year over 21,000 people were fed, clothed, and entertained on Thanksgiving Day. Organization was an important part of this immense project. Volunteers had begun sorting and unpacking since 4:30 am. When we arrived to volunteer, we signed in and received name badges. There was a lull in the volunteer activity until we were assigned the clothing area. Each person in line received one blanket, one coat and as many other items they could hold in a paper grocery sack. Our job was to assist with the blanket area. Items were orderly stacked on tables for the clients to choose from. At 10 am the line started through the area. Families with young children “shopped” the area and moved on to the food line. Throughout the morning, there were children’s activities including visiting with Santa, music, balloons and more! What made the day special was that we as a family took time to do something meaningful together in a new way! It was a new way to view project management on a grand scale and know the commitment of many people to an orderly way to share our blessings. Take this Thanksgiving weekend and chat with your family about what is most meaningful. Take this knowledge on to the next holiday and create new meaningful traditions together! Share with me what your new family traditions are! Learn more from this story in the Houston Chronicle. What can you do early for Thanksgiving? Want to save a little time? Be ahead of the game? Here are are few tips on getting things done for Turkey Day! Invite early! Delegate appetizers and side dishes by asking friends to bring these. Happy organizing and Happy Turkey Day! https://professional-organizer.com/WordPress/wp-content/uploads/2016/07/logo.png 0 0 Ellen https://professional-organizer.com/WordPress/wp-content/uploads/2016/07/logo.png Ellen2009-11-24 17:54:552009-11-24 17:56:32What can you do early for Thanksgiving? At this time of year we feel abundantly blessed! Make a difference for your family in donating toys to area philanthropies needing donations. Here is a list from the most recent Kingwood Observer. Find a worthy cause that you are passionate about. Help your children part with toys and more to take to the facility. Take your children with you to make the donation. Create an annual holiday tradition around this event. Can you think of anything more rewarding during this holiday season? Please add your worthy cause as a comment below so we can share! For me, life is ALL about gratitude! Being thankful, grateful, positive and appreciative are the most important of all things. My wish is to share this with everyone I am in contact with, friends, clients anyone and everyone. 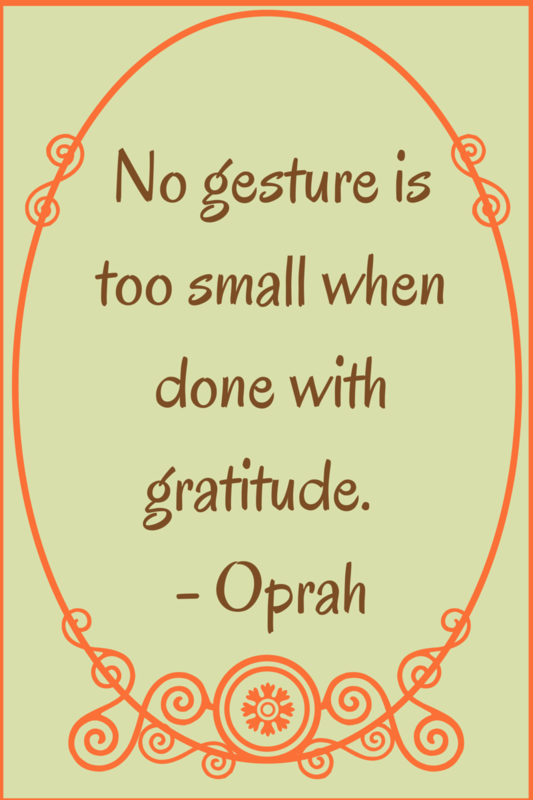 Thanksgiving and gratitude are like peanut butter and jelly, salt and pepper,or milk and cookies. Are we missing the reason for our season with all the focus on turkey and dressing? Is getting ready for the holiday after this one taking away from appreciating all we already have? Thanksgiving is our time for reflection for our bountiful blessings. The connections of order and appreciation are numerous for me. Having order in our home helps us remember all we have and all we hold dear. Organizing is honoring our home, our belongings and our time. Organizing and gratitude come together in my work with my clients. I am honored to partner with them and grateful for their trust in me. As your holidays begin this year, make a list of the 3 most important thanks! Keep this momentum going with your gratitude journal all year long. It will change your life! Join me for a monthly dose of productivity and organizing! Join my newsletter. Taking care of yourself during the holidays is important! How can we care for others if our self care is neglected? Get the rest you need each night. So often I hear my clients say that they have gone to bed at 1 or 2 am to finish a project. Make it a priority to be in bed and get 8 hours of rest each night. Eat and drink nutritiously. Our bodies need good fuel! Be sure to drink 8 glasses of water and each your daily 5 fruits and veggies. We think better, work better and are more productive with outstanding food. Commit to daily exercise. Working our bodies provides clarity and more. My weekly exercise includes working out with Jill Gilbert Lucas at pilates. www.gulfcoastpilates.com. It is a priority because I am better able to handle the stresses of the season with this! Write daily in your gratitude journal. Spend a few minutes at the end of each day being grateful and writing about it. It is as simple as appreciating a hug, seeing a leaf on a tree turn color or even tasting a yummy piece of pie. Appreciating what is a gift to you makes a difference. Spend 5 minutes in serenity time each day. This is a time to get your stress level as low as possible. Breathe deeply, sit in a chair, think of your special thoughts, and get a few minutes of base line. Taking care of yourself goes beyond the holiday season. Not sure how to find the time? Remember, as they say on the airlines, put your own oxygen mask on first! Empowering moms to be their best is what I am passionate about! I love to learn and share the best of what I learn with others. Here are 2 recent conference experiences and what I gleaned. I recently attended the Women Business Owners conference (www.womenbizowners.org) and learned so much from my peers! As I listened to speakers like Linda Stiles (www.lindastiles.com) and Michele DeKinder-Smith (www.janeoutofthebox.com) many important ideas emerged. Here is a little of what I found most valuable in sharing the day with remarkable women entrepreneurs. Find partners in and out of your industry. As an entrepreneur it can be lonely! Find people who are courageous to take the leap, mindful of the different responsibities of their jobs, and empowering of others. Linda shared with us the 4 types of leaders, the take charge, the fun loving, the detail person, and the . Have one of each of these in your mastermind group to add balance for everyone. Michele has a survey on her website to learn the kind of entrepreneur you are. Again, it is about finding your strenghths and partnering with those who can empower you. Women are motivated by many different things including helping others, financial gain, and passion. Most motivating can be stepping up to those things that are hard work for us and make us stronger! Finding a strategy to help us with tough aspects of our business, including cold calls and asking others for help, can make those things happen. Ask for help when you need it. Taking your business to the next level happens when you ask a mentor or coach to be a part of your team. No need to reinvent the wheel! Find someone who can help you that is ahead of you in or out of your industry to help you strategize and be accountable. Have them be on your team too to take you beyond your comfort zone and be the best you can be. I also had the privilege of attending the Texas Conference for Women ( www.txconferenceforwomen.org) . In a convention hall with 5000 other intelligent, creative, and stunning women, I experienced learning on a big level! Tory Johnson (http://www.womenforhire.com/about_us/tory_johnson_founder_ceo) shared with us to put yourself out there and be on top of your game. Marcus Buckingham (www.marcusbuckingham.com) helped us recognize it is most valuable to build on our strengths and manage our weaknesses. His concept is that we should catch and cradle the best of our days to create our best experiences. Suze Orman told us to take care of ourselves first. Sharing the day learning on so many levels as a woman made we realize just how blessed I am to have the opportunities to continue to learn and love each day of it. Marcus Buckingham summed up his thoughts with this. Is that what we all want as women? Share with me how you are all of these! Getting the holiday dinner together is first task for Thanksgiving and the last task for Christmas. It is the time we cherish as we gather together, talk about the holiday with family or friends, and enjoy traditional goodies usually passed from other generations. Here are some simple ways to enjoy the meal. Invite your guests early. Most of us are thinking of the holidays just after Halloween. Is it too early to plan? Not at all! As you invite your guests, this is the first step in knowing the numbers for your dinner. AND as you invite, ask your guests to bring an item they can share. It can be something they remember from their childhood or something they can easily cook or pick up. Mindfully delegating the goodies shares memories and work! Choose your recipes and make your grocery list early. Most ingredients are on sale early on. With your list in hand, you can take advantage (with coupons) of the sales. Plan an area not in the kitchen where you can gather these items before the big feasts. Shop at off hours so you are not in the crush. Take a few minutes to type up the list for the next year and place the list and the recipes in your holiday notebook. Make preparation a family event! Even the youngest can share in cooking. What gets in the way? Perfectionism! Remember that it may not turn out exactly as Martha Stewart but it will be yummy! Ask your family to do what they do best whether it is baking, peeling, table setting or other tasks. Being together in the kitchen is a remarkable experience. Sit down together and have a moment of prayer. There is abundant blessing in our homes. Take time to be grateful. Share with your family out loud what are you most grateful for this year. What works for you in holiday dinner preparation? During a recent meeting of Sharing Organizing Solutions (SOS) the most popular and valuable idea was the holiday notebook. · Collate your holiday notebook by deciding what categories are most important to you. · Keep in an easy to access spot for your use throughout the season! A holiday notebook is a way to consolidate all your ideas, lists and more for the holidays! Finding ideas, adding ideas and accessing ideas are easy! Each year we really want our holidays to be special. Purchasing just the right gift, being sure it arrives on time, wrapping it, and budgeting for all the gifts can all be overwhelming, paralyzing and most especially not in the spirit of the season. Is it time to rethink gift giving and simplify? 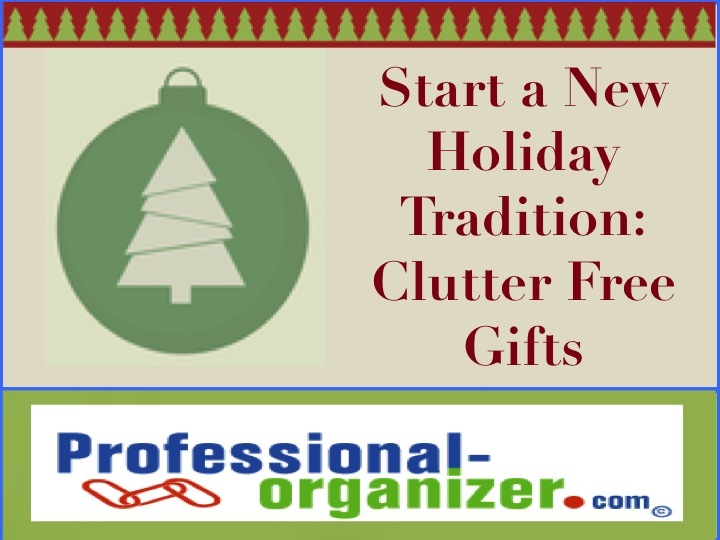 Start a new holiday tradition with clutter free gifts for your family and friends. Our family is moving to the next step of gift giving. We are going to share in the fun of creating our Delap Family Cookbook. Everyone contributes recipes for this. We will print it and share it with the spirit of the season. For our grands, we are giving memberships to the Houston Children’s Museum www.cmhouston.org and Houston Zoo www.houstonzoo.org. It is all about the experiences we will share as we go together to these places. So here are some other conscious consumerism ideas. What creative and fun ideas will your family share this holiday? Make some yummy treats to share with your friends and family too! Mix all together n electric mixer in the order given. Bake in 2 loaf pans sprayed with Baker’s Joy. Bake at 350 degrees for 45 minutes. Freezes well!